There is much of this year of the papers missing. Mrs. Edwin C. Coles of Mansfield, is ill at the home in Washington of her parents, Mr. and Mrs. J. Emerson Rose. Hal C. Williams of Rochester, known here, visited his brother, Hon. George Williams, and his father, Joseph Williams at Wellsboro. William Kitner is here from Michigan for a visit to his parents, Mr. and Mrs. Harry Kitner. Mrs. W. H. Brown will move from Ballard street to rooms over the bakery. Their home will be occupied by their son, Frank and family. Mrs. Robert McClain of Pittsburg, is visiting her parents, Mr. and Mrs. Patrick Howley of High street. Mr. J. W. Beaman left Tuesday morning for Gulfport, Miss., for a visit to his son, Humphrey Beaman and other relatives. The little daughter who recently came to make her home with Mr. and Mrs. David A. Strope, has been named Doris A.
Mr. and Mrs. Frank Ward of Maple Grove farm Troy township recently entertained at luncheon, to announce the engagement of their daughter, Anna, to Mr. M. T. Matter. Mrs. John McKennah with her daughter, of Sayre, visited her mother, Mrs. William Maher, and family the first of the week. Mrs. M. T. Wheeler of Elmira, has been the guest of her daughter, Miss Laura Wheeler, and other Troy relatives. The Rev. W. H. Wheatley, a Canton boy whose wife was Miss Florence Bacon, also of Canton has resigned the Baptist pastorate at Whitehall, N.Y., to accept a call from the Castile, N. Y., Baptist church. Mrs. Richard Kellam’s parents, Mr. and Mrs. Eden Bonney, are back in their Burlington home for the summer from Rahway, N. J.
Mrs. Edward Aspinwall of Buffalo, is visiting her sister, Mrs. Jennie Grant, her cousin, Mrs. Harold Bevans, and other relatives in this boro. Mrs. E. H. Patterson with her children came Wednesday for a visit to her parents, Mr. and Mrs. Daniel Newell and her foster sister, Mrs. Worden at Canton. J. Edwin Vroman, who died last week in Binghamton from pneumonia, aged 34, was a brother of Fred Vroman and Mrs. Katharine Dibble of Burlington. Two other brothers also survive, Horace of Lestershire and Scott, of Candor, N. Y. Mr. Vroman leaves a widow and three young children. With wifely devotion and loyalty, Mrs. Edward McQueen has undertaken the removal of her late husband’s body from the lonely grave in which it was buried at Cascada Falls, Alberta, Canada, last spring to the home cemetery at Ulster, this county. Mr. McQueen was a real estate broker of St. Paul. He lost his life by drowning with two others while on a hunting and prospecting expedition. To reach the railway on their way to Ulster the remains will be brought hundreds of miles by canoe and portage. Leland Parsons is home from Colgate College for a visit to his parents, Mr. and Mrs. Ira Parsons. Dean McClure of Coryland is 44 years old, his uncle Orin, is 88, his mother, Mrs. Electa McClure is 77, and his son Wayne, 22. An interesting instance of multiples of eleven. Miss Ida Watson, 55 years old, who went from her home in Rutland to attend the Billy Sunday meetings in Scranton was found dead in bed in that city Sunday morning. She was a sister of D. E. Watson. Miss Margaret Collins went to Elmira for Easter with her sister, Miss Josie Collins. Miss Veronica Smith visited her sister, Mrs. J. J. Lynch. Mrs. Roy Walters and her two daughters returned to Elmira following a visit to her sister, Miss Laura Wheeler. A marriage license has been issued to Miss Eva M. Wood, daughter of Mrs. Seth Wood, and Mr. Charles Dietz, both of this boro. Mr. Dietz is an employe of the P. E. Sharpless condensery. Mrs. B. H. Hobart went to Elmira last week where she is making her home with her daughter, Mrs. Qua. Mrs. George C. Ziegler with her three children returned to her home in Philadelphia following a visit to her parents, Mr. and Mrs. Abner Griffith in Leona. The remains of the late Marchant F. Wolcott will be taken from the receiving vault and interred in Glenwood cemetery at 1:30 next Sunday afternoon. The Rev. W. R. Holloway will conduct the short prayer service. Mrs. Samuel Jewell and daughter, Miss Irene Jewell of Canton, visited Troy friends Wednesday evening. The remains of the late Augustus Snedeker were brought to this boro from Snedekers on the 5 o’clock train Sunday and taken to St. John’s Catholic church, where funeral services were held, the Rev. P. J. Durkan officiating. Interment was in St. John’s cemetery. Mrs. Clark Joralemon spent several days in New York last week with Mrs. Eva Joralemon Petitt and family. Mr. and Mrs. Warren Lammy, recent comers to Troy, mourn the death of their little son six months old, who died Monday evening. They share the McDowell house with Mrs. Lammy’s parents, Mr. and Mrs. John Morris. Mr. and Mrs. J. H. Bacon were in Mansfield last Saturday to attend the funeral of the latter’s mother, Mrs. Gardner, who expired at the home of daughter, Mrs. E. E. Hayes, in Richmond township. Mrs. Gardner was well along toward the century mark, being one of the oldest women in Tioga Co.
Mrs. J. W. Clark of Waverly, is visiting her daughter, Mrs. Earl M. Bloom. Mrs. Fred Barr has returned to her home in Toledo, Ohio, after visiting her parents, Mr. and Mrs. Patrick Howley. Mrs. L. J. Ballard left Monday for a visit in Chicago to her daughter, Mrs. H. A. Stiles. It is hoped that Mrs. W. D. Morse will come on from Miami, Oklahoma, for a visit in the Stiles home before her mother returns to Troy. Mrs. W. Herman Woodward of Elmira, visited her mother, Mrs. W. B. Gernert and attended the funeral of Mr. Isaac N. Burt in this place on Tuesday. Mrs. Charles Joralemon visited her mother, Mrs. Mix in Canton. Mrs. Charles Ludington and daughter are visiting Mrs. Ludington’s sister Mrs. Truman Morse, in Elmira. Mr. and Mrs. B. W. Leonard of Washington, were in town a few hours Tuesday on their way to Mansfield. Mrs. Leonard was Miss Inez Coles, formerly of Troy. The Will of the Late Newton Merrick Pomeroy. In the name of God Amen: I, Newton Merrick Pomeroy, of the Boro of Troy, county of Bradford and state of Pennsylvania, being of sound mind, memory and understanding, do make and publish this my last well and testament, hereby revoking and making void all former wills by me at anytime heretofore made. First: I commit my body and soul to the keeping of my Lord Jesus Christ, in the assured hope of a resurrection to life eternal through his atonement and merits; and my beloved wife and son to his care who has promised to be a husband to the widow, and a father to the fatherless. Item: I direct my executors hereinafter named to pay my funeral expenses, and all just claims against my estate out of the first moneys coming into their hands available for that purpose. Item: I give and devise unto my beloved wife, Annis Amelia Pomeroy my home property in Troy Boro where I now reside, said property being located on the north side of West Main street; to have and to hold the same unto her, the said Annis Amelia Plmeroy, her heirs and assigns forever. I also give and bequeath unto said Annis Amelia Pomeroy all the furniture contained in said house, books, pictures, paintings, silverware, plated ware, bronzes and all other articles of furniture, useful or ornamental, together with piano and all other musical instruments therein contained. Item: I give and bequeath unto my nephew, D. Fred Pomeroy, my store property situate in the Boro of Troy aforesaid on the corner of Main and Canton Streets, together with the vacant lot immediately in rear thereof, and the building and lot on West Main Street now occupied by W. F. and J. W. DeWitt; to have and to hold same unto him, the said D. Fred Pomeroy, his heirs and assigns forever. Item: I give and devise unto my cousin, Fayette B. Pomeroy lot with double house thereon located in the Boro of Troy on the North side of West Main Street immediately across the Street from the First Presbyterian church and bounded on the west by property of John M. Coney and on the east by property of George S. McGlenn; to have and to hold the same unto him, the said Fayette B. Pomeroy, his heirs and assigns, forever. Item: I give and devise unto my cousin, Edwin S. Pomeroy house and lot on the south side of East Main Street in the Boro of Troy bounded on the east by property of R. C. Kendall, together with the shop property in rear of said lot, the shop property being now occupied by one, Aumick, as a wagon shop; to have and to hold the same unto the said Edwin S. Pomeroy, his heirs and assigns forever. Item: I give and bequeath unto son, Daniel Elazer Pomeroy my gold watches and chains and diamond stud. Item: I give and bequeath unto my wife, Annis Amelia Pomeroy and unto my son, Daniel E. Pomeroy the some of twenty-one thousand dollars. Item: I give and bequeath unto "Glenwood Cemetery Association," of Troy, Penna., the sum of two hundred dollars; in trust, nevertheless, for the following purposes, viz:-that the same be kept securely invested by the trustees of said Association, and their successors in office, as a trust fund, and the net interest or income derived therefrom faithfully applied by them, the trustees aforesaid, annually to the care and beautifying of my lot in said cemetery to the end that the grass on the same shall be properly and regularly cut, the graves and terraces kept in proper condition, and said lot and surroundings at all times present a neat, well tended and attractive appearance. And I direct that in case said interest and income is more than sufficient for said purpose, the excess remaining after faithfully carrying out said provisions shall be laid out and expended in caring for the neglected graves and lots in the immediate vicinity of and nearest to my lot. In case said "Glenwood Cemetery Association" shall for two successive years neglect or refuse to faithfully carry out the provisions hereinbefore stated, then and in such case this bequest shall fall, and the sum so bequeath shall revert to and be recoverable by my estate. Item: All the rest, residue and remainder of my real estate, wheresoever situate, lying and being. I give and devise unto my son, Daniel E. Pomeroy; to have and to hold the same unto him, the said Daniel E. Pomeroy, his heirs and assigns, forever. Item: All the rest, residue and remainder of my personal estate of whatsoever name, nature and kind, including life insurance, bonds, mortgages, judgments, notes and all other valuables of a personal nature of which I may be the owner at the time of my decease I give and bequeath unto my wife, Annis Amelia Pomeroy, my son, Daniel E. Pomeroy, my son-in-law, Francis H. McKnight, my daughter-in-law, Frances Morse Pomeroy, wife of Daniel E. Pomeroy and my niece, Mary L. Davison, of New York, in the following proportions, viz:-One half thereof unto Annis Amelia Pomeroy; one fourth thereof unto Daniel E. Pomeroy; one eighth thereof unto Francis H. McKnight; one sixteenth thereof unto Frances Morse Pomeroy and one sixteenth thereof unto Mary L. Davison. Lately I nominate, constitute and appoint my wife, Annis Amelia Pomeroy, executrix, and my son, Daniel E. Pomeroy, executor, of this my last will and testament. In witness whereof I, Newton Merrick Pomeroy, the testator above named have to this my will set my hand and seal this thirtieth day of September, A. D. one thousand nine hundred and eleven. The engagement has been announced of Mr. John W. DeWitt and Miss Florence A. Fanning, both well known residents of Troy, both well known residents of Troy. The wedding will take place during the summer. Mr. and Mrs. Aldrich Packard entertained at their home on Friday afternoon a small company of young ladies, who were pleasantly surprised by the annoucement of the engagement of their daughter, Miss Iola B. to William Spalding, both of Troy township. The wedding is take place in the near future. Mrs. D. B. York has been in Cortland for some days at the bedside of her aunt, Mrs. G. Bradford, who died yesterday morning. The deceased was a sister of Myron and Mark McDowell and well known here. Miss Olive Ruggles has returned from a week’s visit with her uncle and aunt, Mr. and Mrs. C. L. Landon in Granville. Mr. and Mrs. Me. E. Bailey returned Tuesday from their visit to their son, Percy W. Bailey in Washington, Mr. Bailey was benefited by the change of climate. Hon. F. B. Kimble, a prominent Wayne county man, and graduate of Mansfield Normal School, is dead. Mrs. M. J. French has been over from Mansfield for a visit to her mother, Mrs. George F. Bottcher and family. Mrs. LaMont Lenox of Elmira, visited her parents, Mr. and Mrs. John Honeywell at Leona. Former Judge and Mrs. Fanning have been entertaining at their home in Towanda, the latter’s nephew and wife, Mr. and Mrs. C. M. Smith of Chambers, Neb. Their son, Wilson Smith and his wife accompained them. Mr. Smith went West from this county 31 years ago. He is at the head of one of the largest real estate firms in the Sunflower State. Mrs. Marion B. Catlin and Mrs. George C. Tottone came Wednesday from Canisteo, N. Y. for a visit to their brother, Mr. M. E. Bailey. A divorce has been granted in the case of Maggie May Smith of Burlington vs. Edward Smith, desertion. The friends of the Burt family, formerly of Springfield, will be interested to know that Harry E. Burt, son of Ezekiel Burt of Frewsburg, N. Y., is one of the executors of the will of the late George W. Post of Postum fame, who lately committed suicide leaving an estate of $20,000,000. Harry Burt is at the head of one of the departments of the Postum plant at Battle Creek, Mich.
Frank A. Nichols, who has a good position with an electrical works in Buffalo, is visiting his parents, Mr. and Mrs. E. C. Nichols in this boro. Mrs. L. W. Ballard is entertaining her sister, Mrs. Harry Taylor of Scranton. Mrs. M. A. Burrows and little daughter, Pauline, left on Saturday for a visit to relatives in Washington and Harrisburg. Clifford E. Scouten, son of Morris R. Scouten of Troy, who will graduate next year at the Mansfield Normal School, has passed this year’s examinations second in his class. Mrs. A. W. Johnson of Mr. Royal, N. J., is visiting her son, D. W. Johnson and family. Mrs. James Whitby comes today from Baltimore to be with her daughter, Mrs. G. A. Baldwin, while Rev. Glenn A. Baldwin is at Eaglesmere. Mrs. Margaret Downes of Chicago, is visiting her sisters, the Misses Coney and her brother, John Coney. Col. Pliny Norcross was called to Chicago last Saturday by news of the sudden death of his son’s wife, Mrs. Frederick Norcross. Mrs. John McGoughran is visiting her daughter, Mrs. Howard Ballard and family at McKeesport, Pa. Her little grandson, Master Howard, will accompany her home. The engagement has been announcement of E. Ashmun Parsons of the Towanda Argus and Miss Hazel Armbruster of Mau Chunk, Pa.
Mrs. George Clark (nee Mattie Herrick) of Hoosic Falls, N. Y., is visiting Mrs. Robert Ayers. Dr. and Mrs. William DeWitt of Blossburg, go next week for their first visit to the latter’s parents, Mr. and Mrs. Treat, since the birth of their son. Mr. S. K. Ross visited his daughter, Mrs. Gamage Rockwell, in Elmira, N.Y.
Mr. and Mrs. T. W. Williams of Elmira, spent their vacation with his parents, Mr. and Mrs. B. W. Williams. Jake Williams of Elmira, spent his vacation of two weeks with his parents, Mr. and Mrs. B. W. Williams. Mr. H. A. Weller of Fort Bragg, California, is visiting relatives in this section. He is a brother of L. T. Weller of East Troy and of Frank Weller and Mrs. Waite of Elmira. Harold, son of Henry C. Rolison of this boro, was found badly injured in a Buffalo railroad yard last Saturday morning. His leg was broken his hip crushed and his back lacerated. He is believed to have been struck by a passing train during the night. He was taken to the emergency hospital. Mr. Rolison left for Buffalo by the first train after receiving news of his sons injuries. While his injuries are serious the hospital physicians hope for his recovery. Thirty-eight years ago last Tuesday, Mrs. Henry Fretz died form cancer in the same house in which her husband now lies at the point of death from the same disease. Mrs. William Maher is entertaining her daughter, Mrs. J. E. Kelley from Tuckerton, N. J.
Mrs. George E. Boyer, her sister, Mrs. Nellie Case and daughter, Jeannette, left last evening for an outing at the seashore. Mrs. A. J. Bitner (nee Martha Runyon) and daughter of Allentown, Pa., were guests last week of Attorney and Mrs. H. K. Mitchell. Mr. and Mrs. Walter W. Bauder entertained the former’s brother, John Bauder, over Sunday. Joseph Jaquish of Mansfield, is spending a time in Troy with his brother, Orrin Jaquish. Miss Florence Rolison came from Syracuse for the funeral of her brother, Harold Rolison. The eighty-ninth birthday of Mrs. Maria Woodruff was observed Saturday last by a family gathering at the home of her daughter, Mrs. John A. Parsons. Miss Fannie Wheeler of Williamsport, is visiting her sister, Mrs. Joe Armstrong. 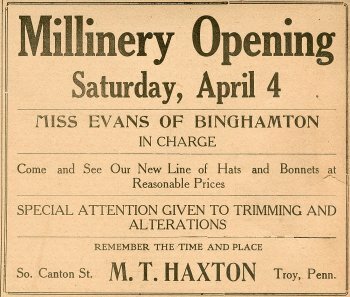 Mrs. M. L. Case has returned to Syracuse, following a visit to her brother, H. J. Pierce and family, and her mother, Mrs. Frank G. Pierce in High Street. Mrs. Ted Burke of Canton, is visiting her sisters, Mrs. N. Shaw and Mrs. J. Franklin Pierce. Herbert Landon, Washington party candidate for member of the legislature, was born in Herrick township, a son of the late Rev. George Landon, July 21, 1866. Until three years ago he lived on the large farm in Herrick owned and operated by his father and of which he became the owner upon the death of the latter. …. Mrs. Vincent Baldwin of Gloversville, N. Y., is visiting her niece, Mrs. Thomas Colony. Mrs. Frederick E. VanDyne and daughter, Mabel Ann, are visiting friends in Boston. Mrs. A. G. Murray and children, Dorothy and John A., from Chicago, are spending two months with Mr. and Mrs. L. Murray who have moved from their Troy township farm for winter into the Casterline house near Granville Centre. Robert and Wilber Head, sons of Former Court Stenographer Arthur Head, who have been visiting their aunt, Mrs. John A. Parsons and family, went Monday with Mr. Parsons by motor to Towanda where they will attend school. Miss Elizabeth Cassada has returned to her home in Pine City following a visit of three weeks to her grandparents, Mr. and Mrs. J. W. Beaman. Mr. and Mrs. William F. DeWitt had with them on Monday in celebration of the former’s 66th birthday their children, Mr. and Mrs. J. Maxwell Beers of Elmira, and Dr. and Mrs. William DeWitt and little son of Blossburg. Mr. and Mrs. Fred Roberts and little son of Rochester, are here for a visit to her father, A. C. Rolison. H. L. Wolfe and Mrs. Lottie Gustin visited their sister, Mrs. J. L. Harding in Williamsport. Alberta Porter, about 8 years old daughter of Gerdon Porter, the new popcorn man, was bitten on the check yesterday morning while in front of the Oliver block, by a hound dog said to belong to John Carnright. The child was taken to the office of Dr. Ballard who cauterized the wound. Announcements have been received by Troy friends of the bride of the marriage August 19th at Valois, N. Y. of Miss Eleanor Gillmor and Mr. Charles Doty Fausold. The groom is a teacher in Starkey Seminary at Starkey, N. Y., where Miss Gillmor also taught. This Week in Troy Forty-two Years Ago. Died: In Springfield, Charlott, daughter of Mr. and Mrs. J. E. Young, aged 4 years. Marriages: Mr. D. A. Allen of Granville, and Miss H. M. Slater of Burlington; at Wellsburg, Aden B. Webb and Miss Mary M. Harlow of Ridgebury. Miss Margaret Rhinevault of Mansfield is spending a time in Troy with her sister, Mrs. H. S. Sweet. Mrs. Isaac Cleaver and daughters, Gertrude and Mary came Wednesday from Ardmore, PA, for a week’s visit to Mrs. I. Cleaver and family. Mr. and Mrs. William Weigester spent a few days at Frackville, Pa. with their son, Dr. Charles Weigester. Mrs. Charles Tidd and Dr. and Mrs. M. B. Ballard were among the sixty-five relatives and friends in attendance at the wedding in Elmira Monday evening of Miss Florence G. Foster and Mr. Gage W. Tidd. Mr. and Mrs. Lee Gates are on a two weeks outing with friends in Penn Yan and Rochester, N. Y. They were accompanied to Penn Yan by the former’s mother, Mrs. E. M. Sharp who will spend a week or more with her daughter, Mrs. Harry McCabe. Mr. John E. Dobbins and Mrs. Emma Hepburn are entertaining their sister, Mrs. Berger of Cleveland, O.
Henry Crandall of Macedonia, Iowa, is visiting his brother, Charles Crandall at Alba and his brother-in-law, E. L. Lewis in this boro. Thrown under a freight train upon which he was endeavoring to catch a ride, Leon Wickizer, 19 years old of Towanda was so injured that he died in the Sayre hospital. Benjamin H. Buck, the young Northern Central brakeman, who was run over and killed by his own train in the railroad yard at Penn Yan last week, was a son of Mr. and Mrs. W. E. Buck of Elmira, formerly for a time of Leona. Interment was at Mansfield. Too Much Speed Responsible for Accident. The Coroner’s inquest at Bridgeport, Conn., into the killing in an automobile accident last Wednesday night, of Frank C. Gernert formerly of Troy and Mrs. Robert C. Seeley, and the injury of Mrs. Gernert and Mr. Seeley, places responsibility on the speed at which the Seeley car was going. There were returning from the Danbury fair. The driver of the car, which was first on the scene testified that the Seeley party passed him twice, once at a speed of about 45 miles and hour and again at 25 miles. He remarked that the big car never would make the curve ahead at the speed it was going, and his prophecy came true. All of the Seeley-Gernert party were pinned under their machine. A letter from Mrs. W. B. Gernert to Mrs. Roarabacher, says Mrs. Frank Gernert is still living but in a very critical condition. She is in such a highly nervous state that she is being kept constantly under to influence of narcotics. Recovery is a matter of grave doubt. Mr. Seeley is the cashier of a Bridgeport bank. Mr. Gernert had built up a fine large wholesale produce business in Bridgeport, in the conduct of which he was assisted by his only brother, Charles Gernert. His sister, Mrs. Andrew Spalding of Oil City and Mrs. W. Herman Woodward of Elmira, and his mother, Mrs. W. B. Gernert were in attendance at the funeral at the home in Bridgeport Sunday afternoon. Mrs. V. Morrell Wilson and daughter, Maria returned Tuesday to their home in Providence, following a visit in the E. E. VanDyne home. Mrs. Harry S. Mitchell spent Tuesday in Elmira with her cousin, Mrs. W. P. Maxwell, while Mr. Maxwell came to the funeral of his niece, Miss Irene M. Long. While H. W. Whitehead and his granddaughters, Grace and Lucy Pierce were driving from West Burlington to Mountain Lake on Monday, a passing automobile so frightened the horses that their wagon was overturned. All were more or less bruised but escaped with no broken bones. Mrs. John Kriel of West Milton, Pa., with her two children, was the guest last week of her brother, Dr. W. L. Rider, Miss Jean Rider went home with them for institute week. Her grandmother will accompany her back to Troy. Mrs. William Sims (Anna Kepler) entertained a company of her friends yesterday at a thimble party. Mrs. S. A. Allen of Towanda, is visiting her daughter, Mrs. E. M. Tomlinson. Dr. J. L. Everts of Elmira, is visiting his sister, Mrs. Edward VanDyne. Evelyn, Carrie and Robert, children of Mr. and Mrs. Anthony Mann, spent the week end with relatives in Williamsport. Mr. and Mrs. Charles Friends and Miss Jessie Stickney attended the funeral in Mansfield of Joe H. Geer, the newspaperman who married a sister of Mrs. Friends. Mrs. Earl Stanton and Master Earl were week end guests in Elmira of her sister, Mrs. Stephen Kelley and family. Mrs. Hattie Manley of Canton, will spend the winter with her son, Lawrence in Washington, D. C.
Mr. and Mrs. Hecter Holcombe of Philadelphia came Sunday for their autumn visit to the former’s mother, Mrs. G. O. Holcombe. (Coryland News) Mr. and Mrs. Lew Brown and son, Rexford motored to Elmira Sunday and spent the day with his brother, Frank Brown and family. (Coryland News) Miss Ethel McLane and Mrs. Chester Wolfe and daughter, Edna, were week end guests of friends in Elmira. Mr. and Mrs. M. E. Bailey are still in Washington, guests of their son, Percy Bailey of the Pathfinder. Mr. and Mrs. Earl White and four sons of Galeton were guests of Mr. White’s sister, Mrs. J. H. Preston and family. Mr. and Mrs. E. B. Redington are to observe their fiftieth wedding anniversary on Saturday of this week. Mr. and Mrs. Lynn Slingerland of Redington avenue, entertained the former’s mother from Mansfield and his brother, Ray Slingerland, a photographer for several years past of Norfolk, Va.
Our readers will be interested in the announcement of the marriage some little time ago of Joseph Williams of Elmira, son of Mrs. Benj. Williams, formerly of Troy, and also of Ernest Hamilton, a nephew of Mrs. Williams. A marriage license was issued Monday to John Spillane and Miss Irene Williams of Troy. On the ground of desertion, decrees of divorce have been granted Daniel E. Barry from Mary J. Barry and Gertrude Hawkins from Harry L. Hawkins. S. O. Billings, a former Towanda boy, son of Samuel Billings, was elected State Senator in West Virginia on the Republican ticket. Mr. and Mrs. H. E. Grace and son Arthur of Alba are visiting their aunt, Miss Hattie Ely of Holley, N. Y. Miss Hattie Bush of Elmira, who underwent an operation in the Arnot-Ogden hospital some time ago for tubercular trouble, is spending a time with her sister, Mrs. Leo C. Lovejoy in Canton. Frank Wooster of Toledo, Ohio was the guest last Saturday of his uncle, H. M. Spalding and family. Masters Edmund and Leland Fanning are to leave next week to join their parents, Mr. and Mrs. L. M. Fanning at Las Cruces, N. M.
William B. Strait is visiting his mother, Mrs. Helen Strait and renewing Troy friendships after an absence of fifteen years in Colorado and Arizona. Mrs. F. W. Hovey and Miss Ethel Hovey attended the funeral in Athens on Wednesday of Mrs. J. S. Thurston. Mrs. G. N. Welch, of Mansfield, announces the engagement of her daughter, E. Ruth Reynolds, to Porter B. Carpenter, of Horseheads. The marriage to take place in January. A marriage license was issued the first of this week to Eugene L. Luckey of Troy, and Sophia B. Lamb of Armenia. Miss Caroline Saltmarsh comes before Christmas from Greensboro, N. C., for the holidays with her sister, Miss Mary L. Saltmarsh. Mr. and Mrs. Clyde Dewey were called to Sullivan by the death of the former’s grandfather, Alvin Palmer, one of the pioneers of that section. Miss Anna Palmer of West Franklin, who has been spending some time in the south for her health is spending the week with her sister, Mrs. Norman Joralemon of this place. Miss Carrie Hickok comes from Rochester for Christmas with her sister, Mrs. D. J. Fanning and family. Their daughters, Mrs. Stanley Moore of Towanda, and Mrs. W. E. Knapp of Elmira and their families come for Christmas with Mr. and Mrs. Charles Teeter.